China is not the first country that comes to mind when you think about skiing or snowboarding. That’s changing, though. The rising Chinese middle class is looking for new ways to spend their time and money, and they’ve discovered snow sports. Beijing has also been working overtime to develop its ski industry ahead of hosting the 2022 Winter Olympic Games. And China has no shortage of mountain ranges in the middle of the country and along its many borders; in fact, China’s outer regions may be where skiing first began 10 thousand years ago. Check out China’s ancient — and also brand new — skiing culture. China has 12 million skiers, just over 700 ski resorts, and the trend lines point upwards. Growth in ski resorts has been nearly nine percent annually in recent years, and visits to those resorts have increased even more. When you hear about Chinese skiers, though, there are two big stories. One is the growth of the market and the rise in number of skiers, all heavily supported by government policy. That’s great for equipment vendors. But the newness of the sport in China means that many ski areas are geared to beginners, which is not ideal for advanced skiers and snowboarders. But there’s more. Even if experienced Chinese skiers with enough money still tend to prefer skiing trips abroad, resorts near North Korea are catering to wealthy clientele. And new ski resorts in China’s border regions don’t just reveal the contrast of ancient cultures against China’s dogged drive to modernize. They may well be where humans first took to skis. The Alps or Rocky Mountains have an established skiing culture — it’s all well groomed, big on après ski, and expensive. In China, on the other hand, it’s the Wild West — or East, rather — of skiing. Resorts rushing to fill the newfound interest in skiing have popped up near urban centers around north-central China — where mountains are low, and snow is scarce. In these local resorts, skiing is more of a novelty than a serious athletic pursuit. It’s an adventure for people who may not have previously sought outdoorsy activities. At resorts farther from cities, China has not yet settled on an ideal development model. Some offer up kitschy renditions of Alpine cottages while others house skiers in monolithic, multi-story hotels. The hope is that with the coming Olympics, newly developed ski areas will find a more authentic and eco-sensitive approach to its emerging ski areas. 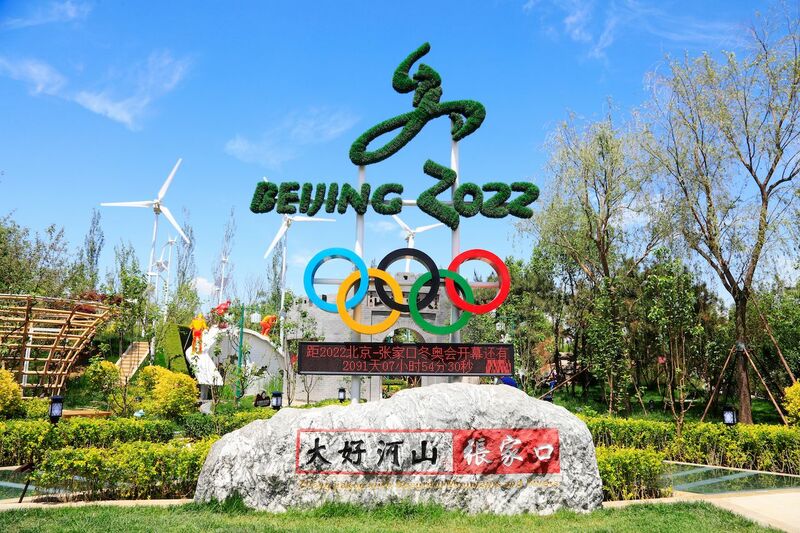 Beijing will soon be the first city ever to have hosted both the Summer and Winter Olympics when it hosts the 2022 Winter Games. In preparation, the country has been building up ski areas and the transportation routes to get there as fast as possible. China says construction at venues such as those in Yanqing and Zhangjiakou is sustainable and that new buildings will better fit into the existing natural conditions. Others claim that construction has re-sculpted mountain slopes and razed entire villages — literally moving out villagers and replacing those villages with a blank canvas of dirt — to make room for the Olympic venues. One thing is certain given China’s willingness to spend any amount of money to ensure successful Olympic Games: The ski areas closest to Beijing will get an impressive upgrade. And the promised high-speed rail lines will cut the time to get to there to less than an hour. Yanqing, the closest ski venue at only 50 miles from Beijing, will be one site for the 2022 Winter Games. The Shijinglong ski resort there only has seven lifts — most of which are currently drag, or “poma” lifts — and reaches only 2,600 feet above sea level. Nonetheless, it’s set to be the location for the Alpine ski races and will rely solely on man-made snow if need be. A more developed resort lies in Hebei province about 40 miles from Zhangjiakou, another future Winter Olympics location. The Wanlong Ski Resort lies between 5,000 and 7,000 feet above sea level, offering skiers a vertical drop of over 1,800 feet. To date, it has 22 slopes catering to all levels of skiers, including some professional teams who race on its FIS-certified pistes. While the ski scene near Beijing is just emerging, resorts in the Changbaishan mountain range at the border between China and North Korea are currently the most established in the country. In addition to groomed slopes, you can find some good backcountry options. International hotel chains like Park Hyatt and Sheraton are here, with the prices and amenities you’d expect from those brands. The best-rated ski resort in the Changbaishan range is Yabuli Sun Mountain in Heilongjiang province. It offers 22 miles of tracks at elevations between 1,480 and 4,500 feet, reached with eight ski lifts. 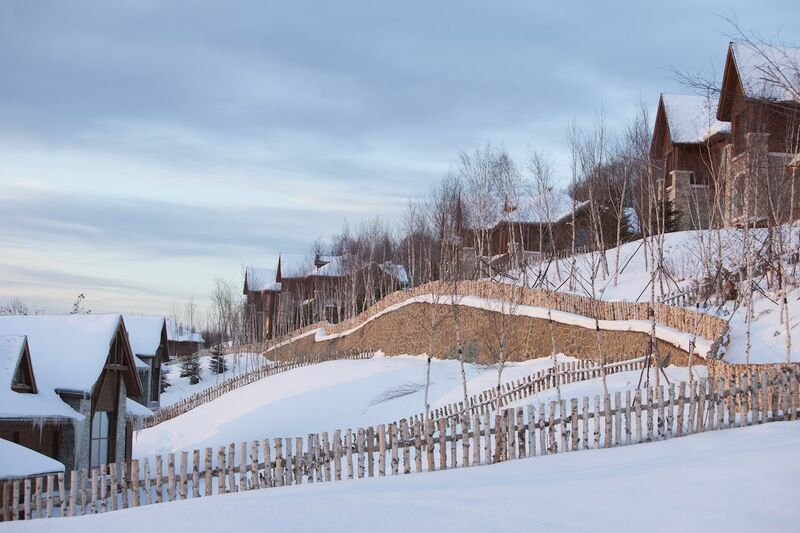 In neighboring Jilin province, the Wanda Changbaishan International Ski Resort also has hotel chains like Sheraton, Westin, and Holiday Inn, and 14 distinct slopes with varying levels of difficulty. You can reach higher parts of the Wanda Changbaishan mountain by snowcat. If you’re a good enough backcountry skier, you’ll find opportunities for dropping some interesting lines — but you’ll have to figure out where this is possible. Snowcat drivers will want everyone to go down the established slopes, and you certainly wouldn’t want to end up on the North Korean side of the mountain. More far-out ski experiences are possible in the outer provinces of China. Beyond the resorts on the border with North Korea, the natural mountainous barriers that have separated China from other countries have also become locations of new ski areas. 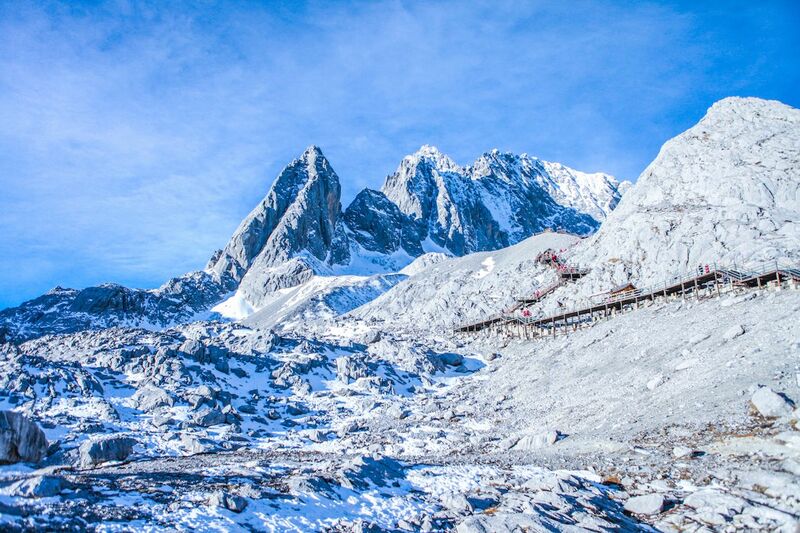 South in Yunnan Province next to Myanmar, Yulong Xueshan — or Jade Dragon Snow Mountain — is the southernmost glacier of the Northern Hemisphere. It’s a fascinating mountain close to the pretty, albeit touristy, old town of Lijiang. The glacier now has a ski resort, which is small but which can take skiers up to a dizzying altitude of 15,000 feet. On the opposite side of the country, due north in the province of Inner Mongolia, is the Alshan Alpine Resort. Alshan Skiing Resort has two different areas: a smaller Western one for ski race training and a larger Eastern one just for snow fun. A hot spring area is also located here. East of there, in Xinjiang province bordering Kazakhstan, lies the Tianshan International Ski Resort. Tianshan Ski Resort lies 50 miles from Urumqi at elevations around 6,500 feet with a vertical drop in some slopes of almost 4,000 feet. The longest piste here is over a mile. Both the Alshan Alpine Resort and the Tianshan International Ski Resort are in parts of China where the landscapes are wilder than in the heartland, with locals who are ethnically and culturally distinct from the country’s majority Han Chinese. Xinjiang may in fact be where skiing was invented. Stone Age cave paintings there show hunters using skies to stalk their prey, and ethnic groups of the region still have such a tradition. The oldest cave painting of a hunter skiing found here is 10,000 years old, suggesting that this region may have predated Scandinavia as the birthplace of skiing. 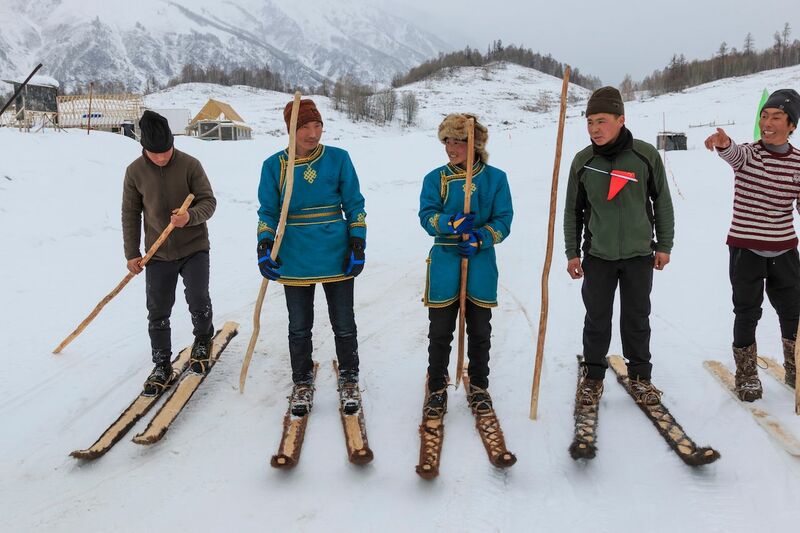 Ethnic Kazakhs and Mongols in these outer provinces still use the skis and are weary of China’s ethnic Han calling China the birthplace of skiing. 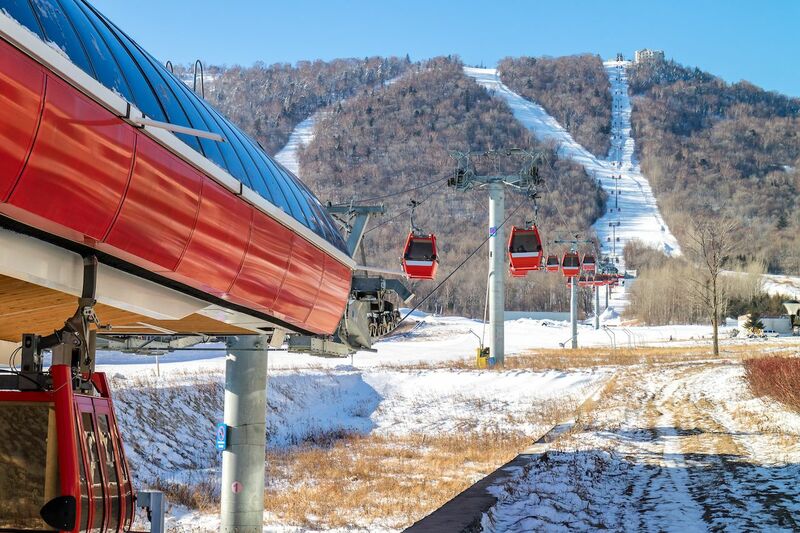 On the one hand, interest in such history and modern ski adventure offerings raise the status of the region and its people. On the other hand, such developments tend to go together with a loss of traditional culture. Skiing can also lead deeper into a China that is still very connected with traditions, yet rapidly changing — the best example of that is Emei Shan. Emei Shan in Sichuan Province, in the center-south of the country, is the westernmost of the Four Sacred Buddhist Mountains of China. As such, it holds deep religious significance, reflected in a large number of temples on it. At the same time, since the mountain offers the possibility of skiing relatively close by Sichuan’s capital Chengdu, a skiing resort has been established there. So how about some spiritual skiing, spending part of the time on slopes and part visiting sacred sites? Perhaps one of the most controversial possibilities would be if the Tibetan Himalayas were to be developed into a skiing destination since that region has struggled unsuccessfully for independence. 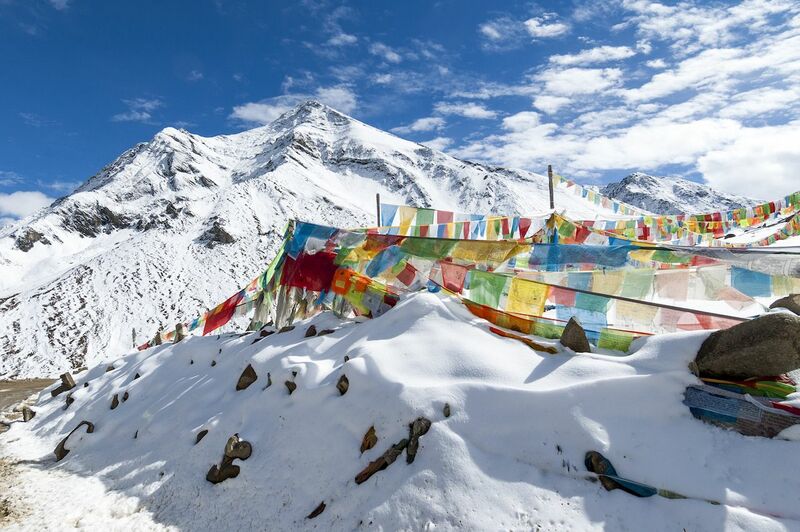 China has announced it will be building the world’s highest ski resort near the Tibetan capital of Lhasa — which is better thought of as the spiritual home of Tibetan Buddhism.